In volume 10, we discussed past Nikon shutters. I also explained many features of the horizontal-travel shutter employed in older Nikon models, from the Nikon "I" up to the Nikon F3. I feel like I was able to cast some light on an issue that had been partially obscured by shadows. I'd like to continue the shutter discussion, with concentration on the vertical-travel shutters incorporated in the Nikon F4 and F5. The mechanisms featured in these shutters differ greatly from those described in the previous issue. Forgive me for starting things off with a technical term, but it is my opinion that this type of shutter represents one of the most important and excellent post-war inventions/modifications in camera technology. The Leica-type horizontal-travel shutter features smooth coupling with its partner, the film-advancing mechanism. The object of the sectional-blade vertical-travel shutter, on the other hand, is to improve the overall performance of the shutter. The addition of shutter blades that could be folded/unfolded enabled the true value of the vertical travel feature to be shown. These shutter blades contributed to the lighter weight of the mechanism (in the interest of brevity, I'll skip the technical explanation). Furthermore, the shutter traveling speed for exposure is shorter with the sectional-blade vertical-travel shutter, as the shutter curtains travel the shorter side of the 35 mm-format (24 x 36 mm) film. These elements combine to give the shutter high-speed operational capability. A Speedlight can be used at a higher shutter speed, and stable shutter speeds can be obtained at an ultra high-speed setting. The benefits of the sectional-blade vertical-travel shutter were not fully appreciated when the shutter was first introduced in the 1950's. Back then, the improved productivity provided by a consolidated mechanism was considered more important. As Leica-type shutters offered smooth coupling with the film-advance mechanism, they were inseparable from the camera body. Conversely, blade-type shutters had an independent mechanism, like lens shutters. High-performance, high-speed shutters were continuously introduced, and shutter units became smaller and more compact. Nippon Kogaku was not one of the companies originally involved in the development of the vertical-travel shutter. In 1962, however, they did release a camera called the Nikkorex F, which had a vertical-travel shutter with sectional steel blades, so Nippon Kogaku did realize the value of the shutter fairly early on. In 1965, Nippon Kogaku incorporated a sectional-blade vertical travel shutter unit in the Nikomat (Nikkormat) FT / FS. In fact, the shutter units contributed greatly to the popularity of those cameras. Business was booming for TTL SLR cameras back then. One reason for the success was the popularity of various manufacturers' focal-plane shutter SLR cameras, including the Asahi Pentax SP (1964), Canon PELLIX (1965), Canon FT (1966), Topcon RE Super (1963) and Minolta SRT-101 (1966). Each of these cameras used a horizontal-travel shutter with cloth curtains. The Nikomat FTN, a modified version of the FT, and the Nikomat-series cameras that followed each employed a vertical-travel shutter, as did the Konica FTA (1968) and ensuing models. Naturally, surrounded by SLRs that featured horizontal-travel shutters, the Nikormat and Konica cameras stood out. Nippon Kogaku's extensive experience with vertical-travel shutters beginning with the Nikorex F, enabled them to determine that the vertical-travel shutters offered a basically high level of performance. To meet the growing demand for daylight fill-in flash synchronization, Nippon Kogaku had begun to study what needed to be done to effect drastic improvement in shutter performance. During this time, they developed a new titanium blade technology. By reducing the weight of the shutter blades by half, Nippon Kogaku succeeded in extending conventional 1/125 sec. flash sync speed to 1/200 sec., and later to 1/250 sec. This technology was applied to the shutter units of the Nikon FM2 in 1982 and Nikon FE2 in 1983. The technology became well known and was used in many models that followed. However, Nikon's top SLR model --- the F3 (1980) --- still employed a horizontal-travel shutter. Vertical-travel shutters were inferior to horizontal-travel shutters in a number of ways. The vertical-travel shutter had lower bearing capacity in film advancing, lower durability, and it allowed more light to enter when the mirror was up. To apply a vertical-travel shutter to the the F3's successors, Nippon Kogaku (renamed as Nikon in 1988) had to first clear those hurdles. They continued studying and developing new shutter blades and related parts in order to create a higher-performance vertical-travel shutter for the F4. The F4 was the first of Nikon's single-digit F-series models to feature a vertical-travel shutter. Nippon Kogaku went with the vertical-travel shutter for the F4 in order to duplicate the 1/250 sec. sync speed of the FE2 and F-801 (1988). As the performance of conventional shutters was insufficient for the high-grade SLR models, Nippon Kogaku employed the newly designed shutter in the F4 --- we can call it newly designed even though the specifications were very similar to those of conventional shutters. Four(4) of the eight(8) blades (two(2) front blades and two(2) rear blades) employed a special epoxy material which featured carbon fiber reinforcement, enabling maximum strength with no increase in weight. Since the F4 contained a mirror-up mechanism, it was very important to find a way to prevent light from getting past the curtain blades into the film housing. Nippon Kogaku opted to use dual multi-bladed curtains for this purpose. The anti-directional movement of the balancer absorbed vibration caused by high-speed shutter curtain travel. Unremarkable, but also featured, were a series of parts which reduced the friction of the rotating shaft, and the adoption of a stopper-hook design used in horizontal-travel shutters for smooth release. The shutter's X-contact did not directly send an electric current but instead turned on the control rectification element. Since this element supplied current to the Speedlight, the life of the shutter's X-contact became semipermanent. The brakes used in horizontal-travel shutters have undergone a series of modifications. In the F4's shutter braking system, a rotating pressurized friction disk was employed. In a horizontal-travel shutter, the purpose of the brake is mainly to prevent bounding. The brake included in a vertical-travel shutter, however, serves to soften the impact of stopping on the shutter blades, thus preventing the blades from being damaged. 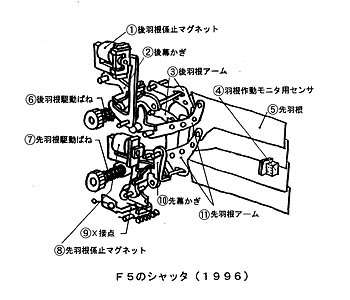 Although the F5 employed a vertical-travel shutter just as the F4 did, most parts of the F5's shutter were newly designed. Nikon worked to improve the stability and reliability of each and every part of the F5's shutter unit. The epoxy plate with carbon fibers for shutter blades was upgraded to offer added strength and durability. This newly developed material reduced the weight of the shutter blades and vibration due to shutter curtain travel. This improvement made the shutter balancer obsolete. The design of the shutter control mechanism was revised to enable lighter, smoother operation. 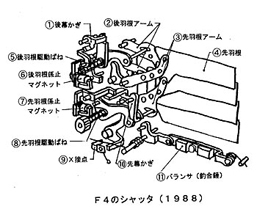 Nippon Kogaku improved upon the shutter brake used in the F4, and the result was a more durable brake for the F5. The positive changes mentioned above, combined with the addition of the Shutter Monitor System which checked shutter speed and watched for malfunctions, meant drastically increased shutter reliability for the Nikon F5. Today, as I look at the shutter for the F5 --- on which Nikon exerted virtually all of its technological power, I imagine what the shutter for the Nikon "F6" will be like. The Nikon "F6", a camera of the 21st. century, may blend a digital recording system with a conventional film system. If a digital recording system is used, the type of shutter Nikon chooses --- and its role --- will depend on elements such as the CCD. I'm still trying to imagine a shutter designed for a camera with a digital recording system. What type of shutter will be used ? What part will it play ? We have spent the past two volumes of "The History of Nikon Cameras" reviewing the development and growth of shutter units for Nikon cameras from the "I" all the way to the world-renowned F5. Nikon and Nippon Kogaku performed exhaustive studies and experiments during the development of their shutters. Naturally this is true of other Nikon technologies as well, but the shutter is a unique mechanism. Housed in a small camera body, the shutter is the only mechanism that can operate at a speed of up to 1 / 1,000,000 sec., and the only mechanism which has parts that must operate repeatedly within 1 / 100,000 of a sec. The "trial and error" philosophy, or simply modifying previous versions, are not methods by which such a painstakingly precise mechanism can be produced. It requires superior technological prowess and development capabilities. As we review the history of Nikon shutters, it becomes evident that none of them were simply re-designed versions of their predecessors. Each was newly conceived, based on design concepts, theory and manufacturing techniques acquired through previous experience. No matter how much a new shutter may have resembled one that came before it, it was most definitely a new shutter with an identity all its own.